Reader, I had not been publishing for quite a while but had so many pieces running that none of it found completion (but things are changing rapidly). Then there was the ‘sudden new development’ which branches out as soon as research brings you to fascinating new information which then has to be absorbed and somehow inserted; things start to balloon. That is where I am now. The simple question of the average width of a passage of a megalithic passage chamber brought a cascade of connections to nearly all aspects of this website. So that is what I am working on now, ‘mastering’ the ‘mer a boire’. Because of the wide scope of this website it is difficult to bring it under one concept, but it remains the same simple whole number mathematics which binds everything together, from Maeshowe and Stonehenge to Saturn and the galaxies on to primes and protons; all one and the same easily memorable natural number logic and geometry. You could call it ‘mathematics of resonance’, ‘geometry of the Pyramids’ or the ‘logic of Nada Brahma’, or even ‘Mathematics for the Millions’, but you don’t have to understand the math to appreciate the site. Anyway the piece below is the score so far of this website and in that sense a concise summary of what’s on and where we are heading. Nada Brahma teaches us that all of existence is a vibrational harmony. I came across this concept just recently. This old Vedic wisdom of ‘sound’ (vibration), Nada, being the basis of ‘all and everything’, the one Brahma, completely chimes in with the basic theme of this website, the number logic of resonance, which sustains the standing wave fields that everything is made of. It is Nada Brahma expressed in simple numbers, ratios and geometries. That is why it is so important*. It was one of those exciting sudden excursions into an unknown perspective, which comes along and perfectly sustains the major ideas of this website. Grateful to express the same idea of harmony of old. My philosophical frame work centres on the concept of the One as an all encompassing ground, which though cannot be described. I had rather not called it by name, like the Tao shouldn’t be uttered. This concept of the One makes it compatible with nearly all major religions and those philosophies which stress the One, like Spinoza’s Monism with one Substance, Buddhism’s One Mind and the one Tao. This then achieves the dream of uniting mysticism and science in One frame work (like the Tao of Physics) , that is what this site is all about, that we can integrate the highest human wisdom in the findings of science, because we have a (mathematical/logical) framework in which everything makes sense based on principles all humanity can unite on in principle. I am in a bit an awkward position with my theories and this website. I am convinced my model is a key to the physical riddle of the universe and that it is so solid it can sustain a grand unified theory (GUT), which is quite a claim I’m aware; my conviction is based on the inherent harmony, the beauty and simplicity of the model and, of course, because it works. I have already shown some of its remarkable results in my analysis of the Solar System, (Solar system resonance) where the resonances of the orbits and their spacing is well known by now, (not so when I started years ago), but still no theory addresses the 9-fold progressions in the masses of the planets, which shows that so-called gravity is just an aspect of resonance, which is the real ordering principle in the cosmic deep-field, as I maintain. I have not yet come round expounding the more precise and decisive examples of the resonances as we find them in Saturn’s ring system and, probably most importantly, in the dimensionless universal constants, for which science has absolutely no frame-work nor explanation at all. The point is, I seem to have the framework because the constants happen to fit my system meaningfully. First fully understand all aspects of redshift, because that is where all the big-bang trouble starts. When the local deep-field is accelerated this would affect the speed of light because the deep-field is the carrier of the light. As I have claimed elsewhere redshift is due to the gravity-well which becomes stronger the further away you look back in space. A similar distortion can occur in supernovae the further they are away. The energy of the supernova tears through the fabric of space and will affect its permittivity no doubt, so there are local deep-field factors which influence the measurements. A ‘substantial’ deep-field does not exist in physics today, although Einstein’s cosmological constant was based on such an idea it seems, but dismissed as a blunder by himself. The problem here is of course the concept of space as a volume. Space has no volume. Space cannot be separated from Mind, and Mind has no volume, or do you think it has. Mind is boundless as space is; and without abode. The concept of volume comes with matter, but matter is exactly a limited volume of limitless space. The core problem is the matter-mind duality. When you step out of the world of duality and into the world of the One Mind you lose all ground. (In Zen the koan runs: Step from the 30 feet pole) That is what enlightenment is about, for one thing. (into Reality, leaving your fears behind). But present day scientists are completely locked up in either their ‘Space-time/Nothingness’ which ‘bends, curves and expands’ or in ‘Quantum particles’ that convey gravity, the ‘graviton’. I feel very uncomfortable with concepts that just don’t fit naturally together and what makes it even worse is that these two interpretations completely exclude each other. This is because gravity is still seen as an ‘attractive force’ emanating from matter or some hypostasized ‘eigen-field’ modelling the fabric of space, whereas gravity is nothing in itself but emerges as a low pressure or shadow region in space, which is shaped by the reflection field of the object, excited in the deep-field surrounding the object, its emerging ‘lee-field’. The lack of counter pressure creates the spherical ‘lee’. The proportional ‘square of the distance’ shows that the same ‘influence’ is spread over an increasing or decreasing spherical area. It seems any EM-field behaves that way too, which signals the sameness in principle of EM- and gravity-field. The one sided increasing pressure results in increasing speed which is acceleration. In my view this persistently wrong approach is due to abolishing the concept of ‘ether’ in favour of ‘field’, because the field-concept does not cover the whole of space, does not connect it like ‘ether’ did, fields are specific, like electromagnetism or gravity, they are seen as something in space, rather than of space. Without a concept of a continuous deep-field, of ‘Substantiality’** (Lorentz), of a ‘Natura naturans’ (Spinoza) or the ‘Unborn’ (Zen), nothing makes sense, whereas everything makes sense when space is energy itself and the inexhaustible manifestation of the One, Suchness. Just a couple of weeks ago Einstein’s central postulate of the speed of light came under scrutiny. The jury is still out on the superluminal speed of neutrinos, but the important thing is that it at least raises questions around his interpretation in which time is inextricably interlinked with the speed of light. So much so that at light speed time is supposed to stand still. If that equation falls away, and it must because ‘time’ does not exist and cannot stand still, then the whole theory as such, falls apart, maybe. I once talked with the Dutch Nobel laureate cosmologist Gerard tHooft after a Sunday-morning lecture in Paradiso, Amsterdam, about relativity and time and came to ask: “what happens to time when things go faster than the speed of light”? He had no answer. This is also in another way a rather fundamental question because it touches on Dark Matter. For us the speed of light is very fast, but on cosmic scales it is very slow. It takes light 100.000 years to cross the galaxy and so does gravity, but how can anything act as a whole with such slow communication between its outer parts. 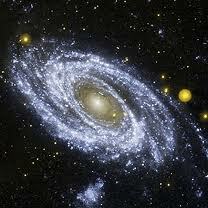 How could the galaxy be a spiral and an inertial unity without being an immediate whole. This ‘immediacy’ is the inertia of the galaxies, rooted in the deep-field, it is the greater speeds and the obvious stress in the deep-field that cause the inertia, the spiral shows that the deep-field stores many speeds perfectly balanced in a seemingly frozen frame. The whirl has the intriguing aspect of appearing as a vortex, ingoing, but at the same time as a centrifugal, outgoing, display of rotation. The vortex of the galaxy is in principle no different from the vortex in your sink, that is the eerie thing about it, the temporal dynamics of that vortex are mind-boggling. But still we can intuit that there is a vacuum at the centre, like in the sink. The Black Hole is the limit of space, its border-point, where the fabric of space is dissolved on the horizon. This is where we reach the border-point of space, the zero-dimension. Space has no outer, only inner limits. In my view the vortex of space-pixall-fabric is so strong that no light will escape but that here we knock on the door of the zero-dimension of pure light. This zero-dimension is in every pixall of space and this is how they are immediately and mathematically connected. The zero- dimension is at the heart of all mass, all pixalls, so indeed everything is made of ‘invisible light’, which is matter; a geometry of light in curved space. Instead of time I think we should take movement, that is, rotation, as a physical dimension, because rotation defines a centre, this way something becomes discrete from its environment. Spin generates individuality, discreetness. This is the principle ‘working’ of the space-pixall’ dynamic: absorption= vortex, ‘particular’, emission=wave-field, ‘general’. The single rotation generates a second perpendicular rotation, a rotating sphere becomes a spindle-torus then a horn-torus, a vortex, and so ‘creates’ a torus as wave centre. If anything is real it is differential in speed, the whole money market is based on it now, abusing it as a matter of course. Differential in speed is as real as it gets, ‘rock-solid-real’ . Forget that in physics ‘anything’ is ever at rest in the deep-field, only the deep-field is at rest; anything is only at rest as substance of the deep-field, but its form, its appearance, always moves like a wave. It is another relativity fallacy, that anything could ever be at rest relative to the deep-field, as argument that there is no preferential rest-frame; it’s empty, the argument. The postulate of relativity is void. The concept of rest in physics is another collective mega-misconception, only the whole is at rest and not even that because it vibrates. Pendulum and gyroscope show us the inertia of the deep-field. The gyroscope particularly displays the crucial role of rotation for holding position, for creating inertia. A spinning top resists gravity, but as soon as the spinning wears down the top starts to wobble until it falls, pushed down by space-pressure. We see from the spinning planets that they create a Euclidean-straight field in their equatorial plane (Saturn), which I call their inertial field. This field reflects the internal make-up of the planet, which may have caused the distribution of mass in the plane, which then over time has resulted in moons and moonlets, but the rings of debris testify of the subtle standing wavefield which is again susceptible to tidal waves of Saturn’s deep-field and passing moons. Since when are tidal waves not gravity-waves you wonder with all the furore over ‘detection of gravity waves’. They don’t seem to see that the gravity wave is the ultimate proof of the deep-field as ultimate medium (aether). I propose taking single rotation as 4th dimension (sphere) and double perpendicular rotation as 5th dimension (torus, curled up), together with the zero-dimension, makes 6, no more. (This is obviously the talk of an outsider, but it relates to underlying principles, Kaluza’s curled up space could be the vortex, anything compatible with Lorentz-transformations is valid in this cosmology). The sphere is the 3-D boundary of space, when seen as contraction. (As an entropic black hole of information it is this side of the zero-dimension, it is one of the most revealing mind-exercises, to transform the inside of a sphere’s ‘surface’ into one side of the circle surface. That way you become the borderpoint of the world, Wittgensteins ‘Grenze der Welt’. Vortices constitute the basic fabric of the cosmic deep-field, they create the space-pixalls but these are not ‘things’, these are workings (singularities) creating the basic field, the cosmic deep-field. The deep-field is not a noun, it’s a verb. In the deep field through ‘differential’, natura naturans, ‘form’ takes shape, natura naturata, but form has no ‘eigen-substance’ so it is empty and impermanent. The Buddhist view. The cosmic deep-field as evolved from the ether-concept is the only way to reconcile the merits of relativity and quantum-field theory, which are both successful tools, but both conceptually weak theoretical views. No more ‘bending time’ or ‘probability waves’. It is with physicists as with archaeologists, they have painted themselves in an impossible corner, where everything they find becomes more and more puzzling and grotesque (at least for the interested outsider), because their whole paradigm is wrong, but they stick to their guns because it is all they’ve got and they can’t let go without losing face (they think). Many other outsiders think they found the key to everything and have all the answers, so I know I am not alone and that the likes of me are dreaded and ridiculed by scientists and ‘intellectuals’ alike, because we are pestering them with our useless nonsensical writings. OK, I understand the sentiment, but this is different. ‘All the others’ try to improve on existing science while I throw the whole approach overboard and, by creating a completely new mathematics and set of concepts, a new language, I try to solve the seeming paradoxes that have halted theoretical physics for about a century now. That this model works for the Pyramids and the Stone Age is a spiritual gift, as it expresses as nothing else the unity of the human mind across cultures and ages. This rare gift of antiquity has given this system a timeless and cosmic flavour and both ancient ‘megalithic’ cultures have had a profound impact on me and hold deep significance for me, because the mathematics of both bridges 5000 years of human understanding and communicates as if presented yesterday, it thus proves to stay the test of time through history, this is its spiritual and cultural value, but the real core value of this mathematics, I am convinced, will only show in its decisively revolutionary impact on science. It is old, maybe odd, but it works, it is true. My findings cannot be explained other than in highly speculative ways, but my scientific facts cannot be denied, I challenge anyone to prove me at fault in my methods, my data or calculations, that is hardly possible, I think, because in this system a faulty input immediately derails the logic. The only thing left for the sceptic is persistent disbelief before the facts, which is not scientific, but very human . There can be no discussion about the same ratios and data in Giza and Brodgar and that is the overriding mystery. How on earth is this possible and all the other fitting mathematical facts I find in Orkney , Stonehenge, you name it. There is no denying the circles I found in the construction of Maeshowe, nor the ratios of circle, platform edge and ditch edge of Brodgar in the same perspective, or the 9-fold progressions in the Solar system. Again and again the heart of the mathematical model is expressed in architecture, carved in stone, or most precisely reflected in myriad mathematical forms (patterns) of Nature, there is no denying it, the 9-fold model fits the facts. * In the piece I am working on, again the mathematics shows in the ‘rationalisation’ of the square root of 3 (1.732050…) how resilient the model is, here a third power of 7 divided by 9 x 22, arises and gives the standard approximation of 343/198 = 1.732323232… This third power of 7 is the axis of the sphere encompassing a cube, which may symbolize a new regular expansion on a Pi of 22/7 and it is finally the edge of the cube encompassing the smaller cube diagonally, creating a cube of volume the ninth power of 7, just over 40 million. This is where the model seems to stop, the cube in the cube, where there is a ‘grand finale’ in ‘rationalising’ even the third power of sqrt3 (5.196 15…) into 5145/990 = 5.1969696… = 7^3 x 3×5/9x10x11, so in approximate numbers the small cube relates to the big one as 66 (3×22) to 343 (7^3), it is 3√3 as 343 / 66. See more on this in ‘Metrology’.